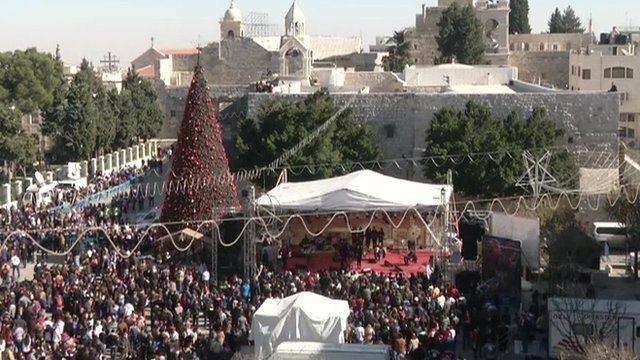 Crowds of pilgrims and tourists have begun to gather in the biblical town of Bethlehem to kick off Christmas Eve celebrations. The nearby Church of the Nativity sits on the spot where the Bible says Jesus was born. The number of visitors to Bethlehem has been steadily rising in recent years as peace talks to resolve the Middle East conflict have resumed. Despite the erection of Israel’s separation barrier with the West Bank, which appears as a high concrete wall around the town, three gates have been opened for Christmas to allow the Christmas procession led by the Latin Patriarch coming from Jerusalem to enter the city. In Vatican City, Pope Francis has made a Christmas visit to Pope Emeritus Benedict, 86, and said he found his predecessor looking well. Pope Francis, who was elected in March, spent about 30 minutes with Pope Emeritus Benedict in an ex-convent on the Vatican grounds where the former pope has been living since he stepped down earlier this year, the Reuters news agency reports.